We took the kids to opening night of Monsters vs. Aliens, in 3-D, of course! A good time was had by all. In the movie there is a monster called Insectosaurus. 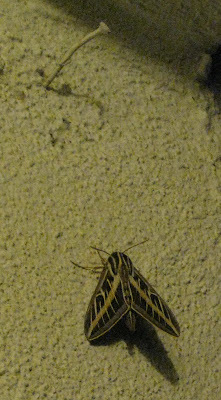 Benjamin and I were whispering during the movie that we thought just maybe he might turn into a giant moth... We returned home to find our own giant moth hanging out by the front porch light. Big by our regional standards, the nail in the photo is just over three inches long to give you an idea of scale. The boys screamed like little girls as they ran into the house under the moth's watchful eyes. Yes, Nathan, monsters are real... Funny kids! Cool photo of the moth. I believe that moth is a sphinx moth and they often get harder to find these days http://www.butterfliesandmoths.org/images?l=3448. They are so pretty but because they are so big they can also be a bit scary. Sorry, the nerd entomologist in me couldn't resist identifying it.